Here’s a Ford Transit Connect wrap that is an excellent example of a quality vector design that was recently completed by the 3M certified IDWraps.com team. Vector is a word that gets thrown around alot in the design community. So what exactly is a vector graphic? A vector graphic, in simple terms, is one that is composed of simple linework. This may be straight segmented lines, or curves. The other most common graphic type is raster, which is composed of pixels, or a bitmap. The raster is more of a photographic, or photoshop type image. Vector graphics are surely the latest trend in graphic styles. In the age where folks are waking up to the idea that the old photoshop “nephew” art is becoming out of style and less functional- vector is surfacing as a good choice. The vector files also produce nice clean lines and razor crisp text when graphics are blown up to large sizes. 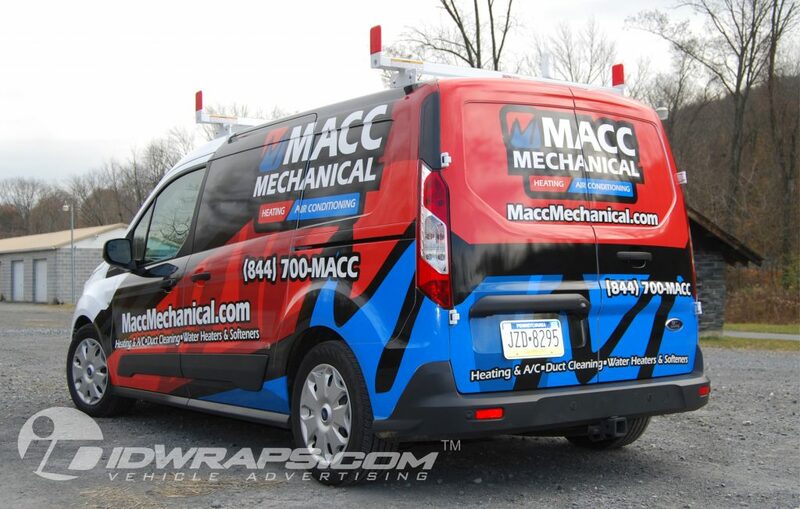 There sure is a difference between designing for small print items and large format graphics such as vehicle wrap like the Transit Connect wrap pictured below. These clean designs are proving to be much easier to read at distances, hence, way more effective as an advertising medium. This trend is not only present in high quality vehicle wraps, but also becoming prevelent in all sorts of advertising methods. At least with the better wrap shops; gone are the days of unreadable graphics. This issue continues to plague the vehicle wrap industry, as crazy busy graphics are not what the best vehicle wrap solutions are all about. The good news is that the better, usually the 3M Certified, shops follow modern graphic design disciplines and science. So reach out to us for a highly effective head turning wrap solution! There’s nothing exciting about the ordinary conference room. There usually plain white boxes where staffed is placed and expected to get excited about the upcoming agenda. This is not the case for the folks at William Elek Plumbing. Pictured below are custom conference room wall graphics that the IDWraps.com team produced on the latest HP latex printing technology. The latex ink is great for interior applications, as it doesn’t smell like a solvent saturated auto body shop for weeks after the installation is complete. Being water based, there are no harmful VOC’s emitting from the prints. 3M has shown studies that some solvent inks used predominantly in our industry could be emitting potentially harmful fumes for as much as to 30 days post installation. A special thanks to the folks at Pinnacle Exteriors for choosing the 3m MCS Certified IDWraps.com team for their contractor wrap graphics project shown below. Their management worked with our nationally recognized professional design team on this super clean and upscale design. Doing a great deal of upscale work, Pinnacle chose to avoid an overly busy design (which happens to be a pet peeve of our designers.) Check them out at www.pinnacle-exteriors.com. You see, our industry is plagued with graphic shops designing wraps that just have “too much going on.” This cluster of graphic overload is never a benefit to the recipient of the wrap graphics, as our prime rule is quite common sense. IF YOU CAN’T READ IT, WHAT GOOD IS IT. That’s right……The more design elements and text you add to a design, the less likely it is to be read. We prefer to follow similar design rules that a billboard company would deploy. Eight words or less is best on each side of the vehicle. If you can’t read it in 2 to 3 seconds, the ad has likely failed. The only exception to this rule is for largely static vehicles which may be parked for long periods in high pedestrian traffic areas. Plenty of those reading this may think that these vehicles below are partially wrapped, when in fact these are full contractor wrap graphics applications. This customer opted for full vehicle paint protection, along with their graphics. When the wraps are removed in a few years, the paint will have been preserved which gives a large boost to resale value. This in and of itself has proven to pay for a large part of the wrap advertising investment. Nothing like another huge jump in ROI. 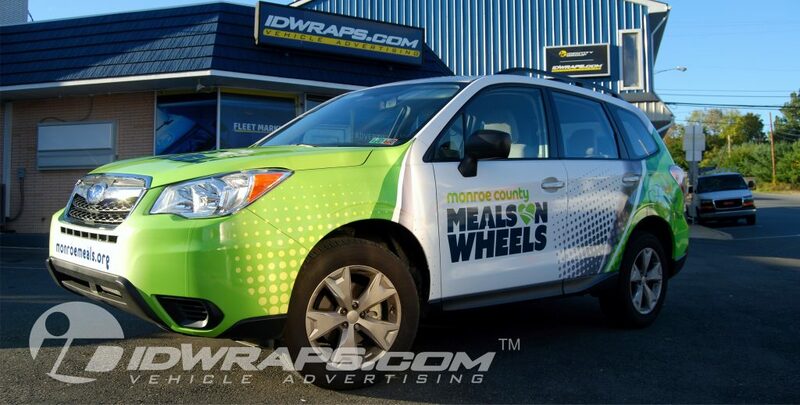 Also partnered in this wrap was Ertle Subaru, which is located in Stroudsburg PA. 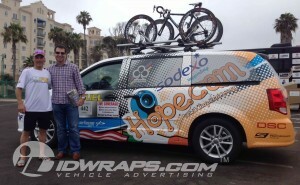 They provided the vehicle that the IDWraps.com team covered completely in premium 3M vinyl. The full wrap is key in these situations, as it provides paint protection for this new vehicle. When the vehicle is returned to the dealership, the wrap may be removed and like new paint is revealed. Many folks believe that you shouldn’t wrap a leased vehicle. The opposite is surely prevalent throughout the automotive industry. Leasing companies LOVE wraps. Anything that protects the condition of the vehicle exterior is surely an advantage to the leasing companies and dealerships. We’ve seen plenty of new vehicles wrapped, and then removed 100K miles later, only to show nearly new paint under the wrap. The Subaru Forester wrap is essentially an air tight car cover that is completely removable without damaging the paint. This is surely a win-win for everyone, whether you’re leasing or purchasing your vehicle. In the context of ownership, it sure is nice to get a big boost to resale values. Many real estate investors leverage little yard signs to spread the word. The folks at PropertySeller.org chose to use a 14ft box truck to make a big splash in attracting home sellers. Many “flippers” like to surf MLS and auctions to find the right deals. This company is leveraging the real estate wrap pictured below and is getting excellent results. The ROI of this advertising is very high, as box trucks may be acquired at a relatively low price, sometimes for just a few thousand dollars. Add the cost of a typical wrap, and you have a highly effective billboard with an amortized cost of less than a few hundred dollars per month. This is way cheaper than using roadside billboards which may cost thousands per month. It also could compare to the typical little yard signs that get seen momentarily, and then get tossed either by land owners or competitors. Yes, your competition may very well be steeling your signs! Ownership is another value added to this strategy, as the term length of real estate wrap is typically 5 to 8 years. If you would divide your cost out over 60+ months, this essentially becomes a no brainer. Mobility is yet another advantage, as this van may be strategically placed in high traffic areas. Owners may place the vehicle in shopping centers for the day, or make an affordable deal with a local business owner. 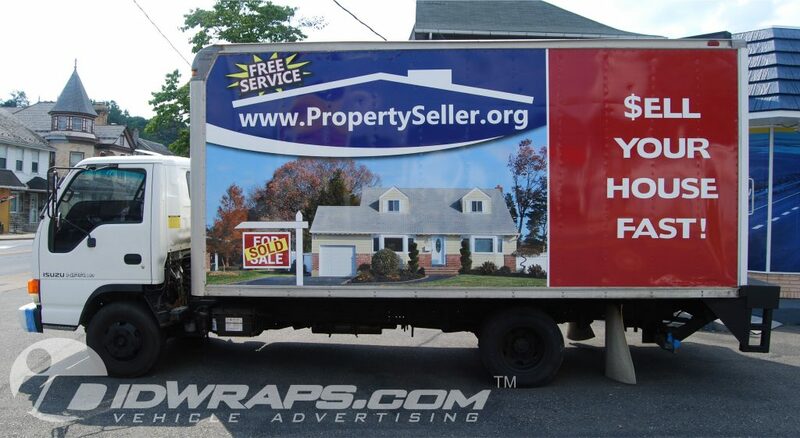 In the end, a real estate wrap may yield equal results to an expensive roadside billboard at a fraction of the cost. The average small town traffic light has 10,000 vehicles passing through daily, and city highways may have 30K to 60K+ daily traffic. It’s clear as to the level of exposure that is possible. 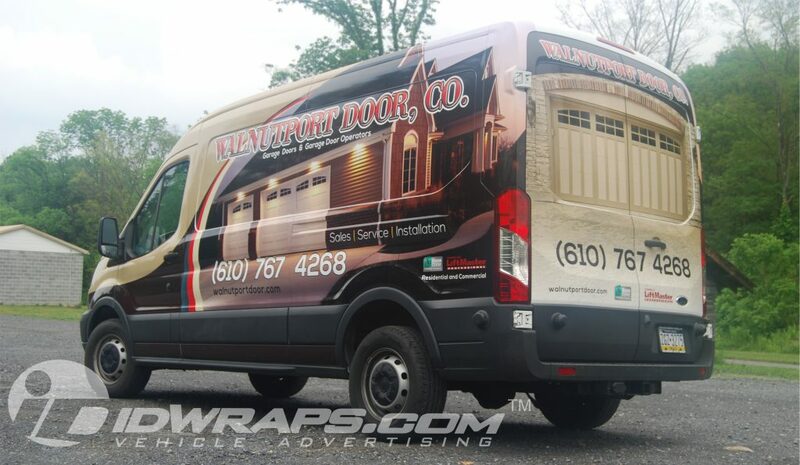 Pictured below is a Ford Transit Wrap we recently completed for the folks at Walnutport Door Co. Be sure to check them out at www.walnutportdoor.com. They came to the IDWraps.com 3M MCS certified team with a completely blank Ford Transit full size cargo van. Our nationally recognized design team sprung into action with a mix of photographic and vector artwork on all sides of the work van. Also wrapped is the front cowl area which is located right over the windshield. Especially on high top versions like this, it is very common for us to wrap this area. An omission of a cowl wrap creates the impression that something is missing from the full wrap graphics. On partial wraps, we nearly always include at least a spot logo on this area. We also saved our client some dollars by avoiding roof wrap coverage. Since the folks at Walnutport Door typically drive through mostly rural areas, there are not many prospects looking down from high buildings. On tall vehicles such as cargo vans, the roof is not easily seen unless the viewer is in a highly elevated position. Our city customers are sure to take advantage of roof wraps, as at any given moment, many prospects may be looking down on their Ford Transit Wrap. Wrapping walls have never been so much fun. 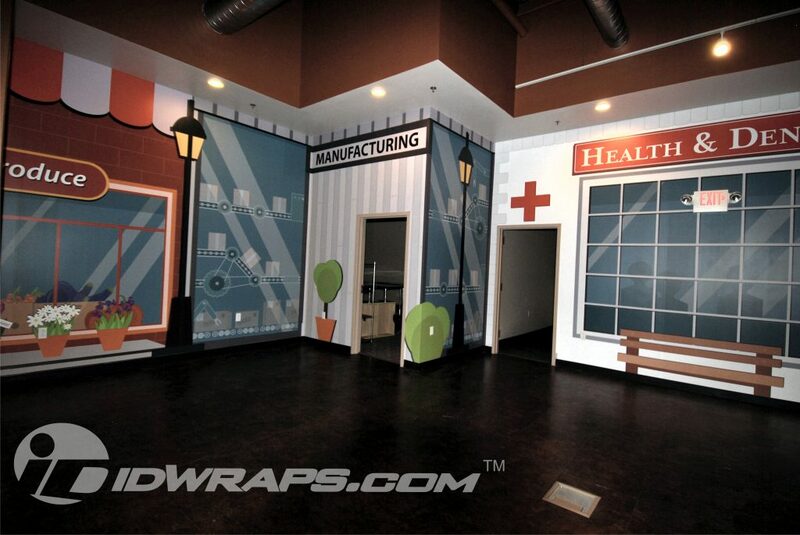 The kind folks at Imagi Nation enlisted the IDWraps.com team to design and install essentially a virtual town at their Allentown PA location. This graphic wall mural directive entailed floor to ceiling graphic mural applications on a 360 degree view of all interior walls. Our creative team illustrated, from scratch, a colorful and playful scene of various experiential facilities for kids to learn from and enjoy. This all started with a precision survey of the facility where a measurement of every wall and obstacle was accurately sketched and photographed. This data was then transferred to a CAD engineering drawing for our creative staff to use as a template for the creative work. After many meetings and emails with our client, the fine tuned graphics were ready to print. We are always sure to include a printed color proof with all of our wrap projects, so the client has an accurate expectation of the color output from our printing equipment. With the approvals in place, we printed the textile based/removable wall films on the latest HP latex printers. The latex printing is great for this sort of project, as there are no VOC’s emitted from the inks. This makes for a super safe environment for the staff and all their precious little patrons. 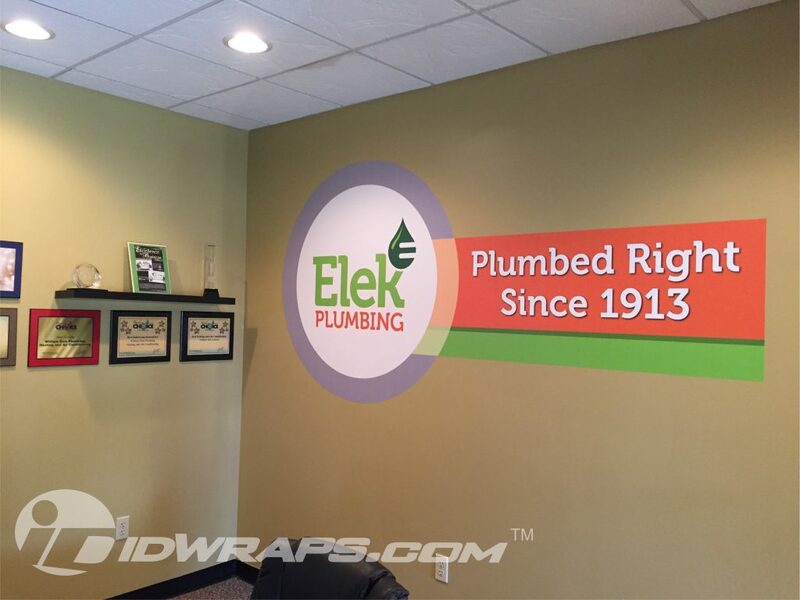 Our 3M/PDAA Master certified installation team had the bulk of this graphic wall mural application done within the scope of a work week. As with many IDWraps.com projects, the client was inspired to do some small add ons as they were inspired by the new exciting look of the space. This included exterior view through window wraps, along with brick wall wrapping, and small interior signs and a backdrop for their news anchor desk area in the media studio. For a better look at the facility: here is a video from a local TV station: Click Here- WFMZ. Imagi Nation is an interactive, educational, entertainment experience where children ages 3-12 can role-play over 40 different careers within a realistic, kid-sized community. In this pretend world of business enterprises, children choose professions facilitated by Imagi Nation Ambassadors and are paid with Biznis Bucks for the work they perform. In the Imagi Nation economy, they can also pay for entertainment and shopping opportunities, or choose to save or donate their Biznis Bucks to a charity of their choice. The 5,120 sq. ft. indoor metropolis is comprised of branded “enterprises” created by partnerships with leading Lehigh Valley companies and organizations. What a pleasure to be involved with the folks at Hopecam on a car advertising wrap. Pictured below is a fully 3M certified wrap we conveniently installed on site for our client on a rental van to be used in the Race Across America. National installation and service near you! Here is Joe Barr (left) pictured with Hopecam founder, Len Forkas. Call us today with any questions regarding car advertising wrap projects. 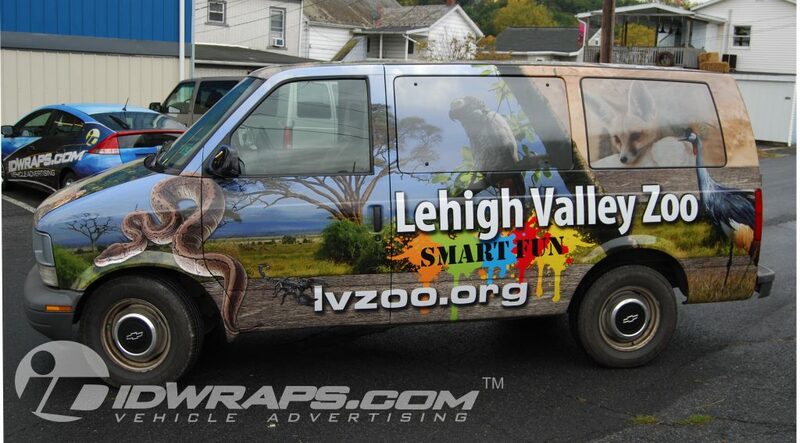 The IDWraps team lives and breathes vehicle wrap advertising and are ready to wrap nearly anything from cars, airplanes, and even architectural applications such as wall, window, and floor wrap graphics. Quality is assured as our company is fully 3M UASG and MCS certified. We also hold PDAA Master certification status. If you’re a listener of Cat Country 96.1, it is likely that you’ve heard us along with Becca and Malone speaking about their radio station wraps. 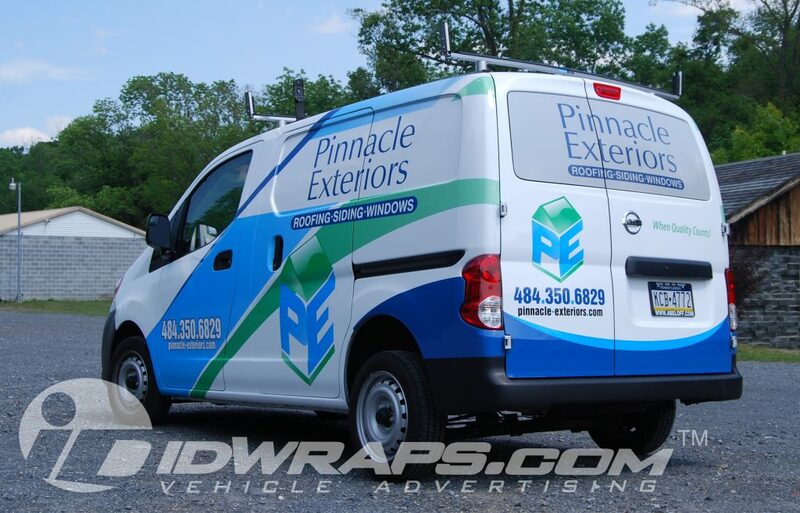 The IDWraps.com 3M Certified team recently completed the two vehicle pictured below: a GMC cargo van, along with a Jeep Liberty. These vehicles formerly were wrapped by another shop years ago and the graphics were showing their age, especially on the Jeep. The wrap on this vehicle came to us fraught with cracking and peeling throughout the installation. The materials on the radio station wraps appeared to have failed far too soon, considering that the wrap was only an estimated 5 years old. Upon removal, we found that the generic materials used had actually fused themselves to the paint. We were shocked to see the clear coat bubbling up from contamination from the unknown vinyl wrap material adhesives. In addition, the formerly shiny metallic silver paint was now almost tan color in many places. We surely have seen paint damaged from cheap wraps, but this was a first that the color shifted to a completely different gamut. No doubt that there was absolutely no money saved when selecting this lower cost wrap, considering the paint damage which could cost thousands to repair. There are many vinyl films available to the radio station wraps market at various price ranges. This situation may be a prime example where the material selection by a wrap shop becomes critical. The best wrap films have fully removable properties and do not damage factory paint when removed from the vehicle. Very often, a little extra investment in quality materials can go a long way in regards to lower removal labor costs and avoidance of paint damage. Keep an eye out for these mobile CAT billboards at an event near you!